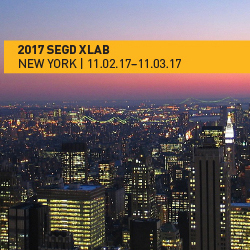 SEGD’s Xlab returns November 2nd to New York with a focus on change and innovation in experiential graphic design. This year’s theme, Experiences in the Era of Disruption, will showcase how disruption is impacting experiential graphic design and the way people are using and interacting with places and spaces. The event will feature a stellar lineup of visionaries: Living Map, Civiq, DailyDOOH, Float4, Lab at Rockwell, Reality Interactive, Gallagher & Associates, WeWork, Intersection, C&G Partners, Potion, Tessellate, iart and Two Twelve. Become a student member of SEGD today for only $50 and attend Xlab and all future events for FREE!